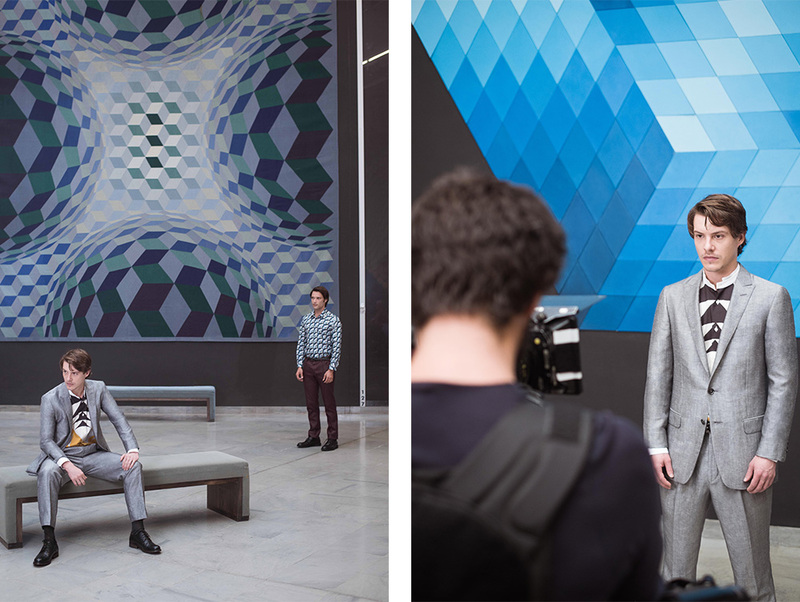 Delving into the dizzying depths of Fondation Vasarely’s Op-Art décor, the brand new Pal Zileri campaign marks another dramatic step in affirming a new identity. As Creative Director of the house Mauro Ravizza-Kireger enters into his second season with his Spring/Summer 2016 collection, the Pal Zileri house joins forces with Australian actor Xavier Samuel to produce a unique showcase. The short film, titled Dynamo, ventures into the avant-craft of the brand’s core, exulting the fine visual details of the brand’s Italian tailoring. Directed by Axel Filip Lindahl, the short film explores the visual similarities between Victor Vasarely’s geometric works and the motifs of the summer collection. Sharp masculine lines are echoed in the architecture, whilst the accumulative configurations of the Op-Art walls emphasize the urban designs of the textiles used. Star of the Pal Zileri campaign, Xavier Samuel made noteworthy appearances alongside Brad Pitt in Fury, and opposite Kate Beckinsale and Chloë Sevigny in Love and Friendship, set to be released this month, when it premieres at Sundance Film Festival. Founded in 1980 by Gianfranco Barizza and Aronne Miola, Pal Zileri built a name around excellence in tailoring and suiting, whose unparalleled quality in textile manipulation still builds the brand’s core. Discover the Pal Zileri Spring/Summer 2016 collection here.